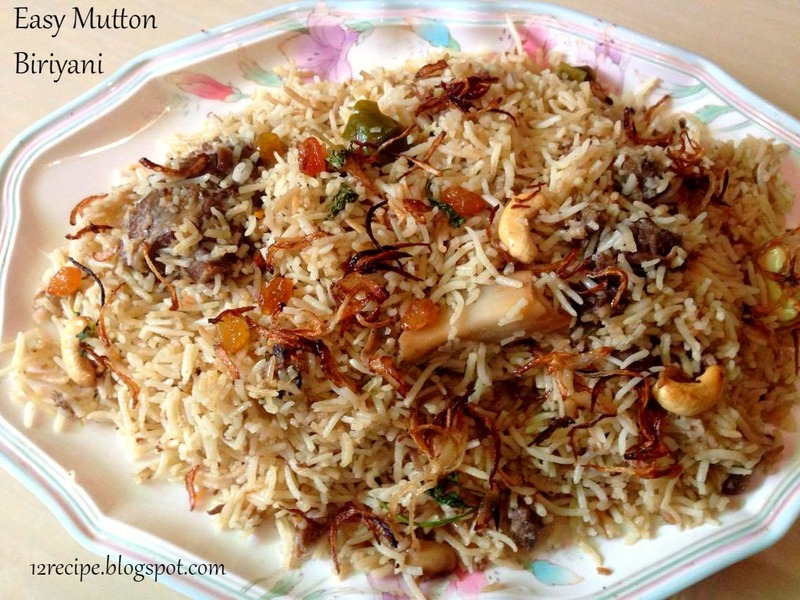 An easy and quick Royal mutton biryani recipe for the busy folks and bachelors. 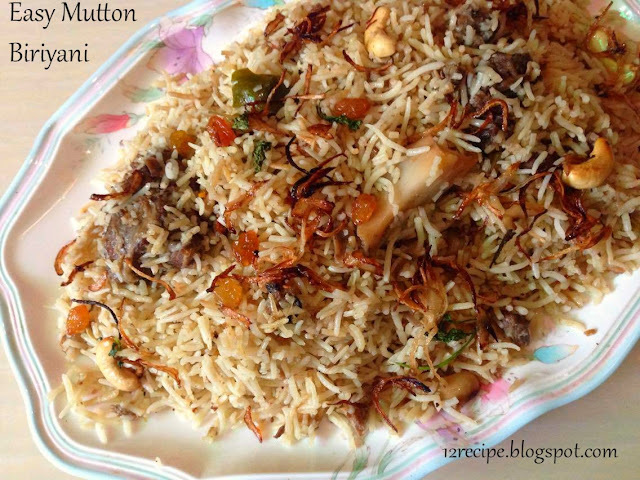 Pressure cook mutton pieces with 2-8 ingredients until done (cooked 3/4 th, add only little water for cooking.).. Heat oil in a pan, add onions ans saute until nice golden; add ginger garlic crushed and green chilly; saute for another two minutes. Add turmeric powder, salt and biryani masala powder; mix well. Add chopped tomatoes and saute until mashed well and disappears in the gravy. Add the cooked mutton pieces and mix . Cook for about 5 minutes. Add half of mint leaves and coriander leaves chopped.Switch off the flame. Wash and soak the basmati rice in water for 30 minutes. Cooks it with enough water by adding whole garam masala pieces and salt. Cooks until the rice is cooked its 3/4 th; drain it and do the dum process. In a dum pan; add little ghee (or oil)and spread the mutton masala. Above that spread the rice. Spread little ghee, fried onions, cashews, raisins, remaining coriander and mint leaves, kewra water and little biriyani masala powder on top. Cover the lid tightly or seal it with flour dough. Slow cook (simmer mode) for about 20-25 minutes and open the lid after 10 minutes; give a nice mix and serve!! !